If you want to join this blog, please send an email to andrew@amplifiers.com.au. I will then send you an email request to sign up as a blog member. Unfortunately, this is not an automatic process due to the old-school clunky blog host I use, and it relies on a real human being (ie: me) to do site admin stuff. This one is a rebuild from an old PA chassis. 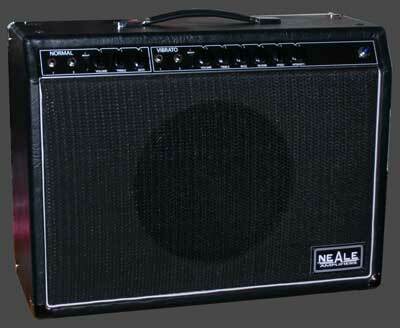 A twenty watt harp amp. Close observers will see three signal tubes in this shot - I needed some more drive for the power amp, so added an extra gain stage. This is my latest amp for my hi-fi rig. A1939 design using direct heated triodes designed in the 1930s. How does it sound? 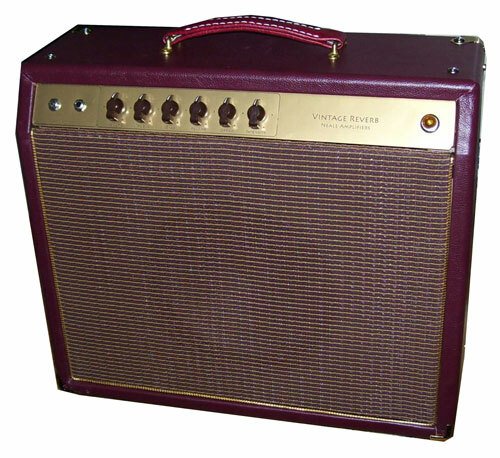 The best amp I have ever heard, it's that simple. Layout is not the tidiest, but it doesnt affect the sound. Polypropylene coupling capacitors, nothing special. I wonder how vintage oil caps would sound. Hmmm, must try that. I have been slow in updating this blog with new amps. Here are some new ones. 6V6 18 watts, Ampeg style amp. Baxandall bass and treble, with a middle control of my own (both cut and boost). reverb and tremolo, Weber 12F150 speaker. This one is the classic Princeton circuit, but done with 6SL7 octal pre-amp tubes, for warm warm vintage tone. 18 watt 6V6 power amp with GZ34 valve rectifier. "I tested the amp at school with one of my students, it was the first time he had every played a valve amp ( although I did not tell him until later). I let him turn it on and let the amp do the rest. He know nothing about the amp at all. It was beautiful to watch and hear, his playing became instantly more refined, as he could finally hear all the detail in dynamics and tone colour. The picture told the story immediately. He stopped talking , he listened, his eyes glistened, his playing became instantly expressive, a magic moment for me as a music teacher. thanks mate..twas a good day." 6V6 18 watt amp, valve rectifier, fixed tone stack. 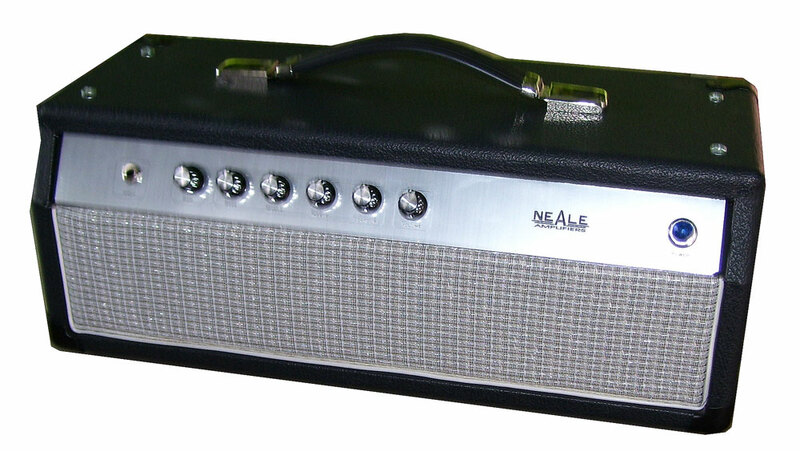 Have just finished a simplified Deluxe amp. My customer didn't want tone controls, but did want a proper BMT tone stack, so the amp has a scoop, so hardwired the classic blackface circuit as if every control was at 12 o'clock. The only controls are Gain, Bright, Volume. 5AR4 valve rectifier (5Y3 also provided for a browner, more compressed response), ex-soviet military 6V6GT (cathode biased), cheap and cheerful Chinese AX7s. 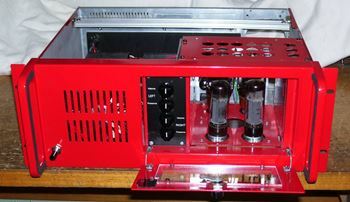 I have just finished a stereo rack amp, with a pair of KT66 on one side and a pair of EL34 on the other. Just Volume and Presence controls for each channel, that's it. 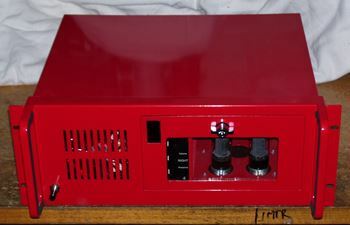 Ben cut down and spray painted an old computer case, so it's Ben's Big Red Rack Amp. 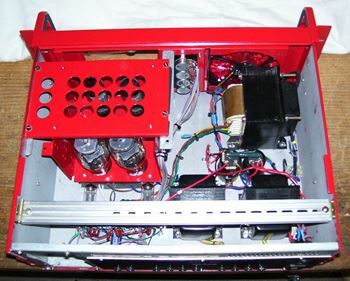 Here is another set of pics, posted by the owner of this amp, showing work in progress images.